Robert Pattinson Joins The Cast of "Lost City of Oz"
Robert Pattinson has landed a part in Lost City Of Z with Benedict Cumberbatch. The movie is about the famed British explorer Percy Fawcett who vanished in 1925 while searching the Amazon for a mythical lost city. The film is based on David Grann’s 2009 best-seller – The Lost City of Z: A Tale of Deadly Obsession in the Amazon. According to The Wrap – Brad Pitt was initially attached to star but is now strictly producing the film through his Plan B banner along with Dede Gardner, Jeremy Kleiner and Anthony Katagas. It hasn’t been revealed what role the Twilight star will play. For more TMW coverage on Robert Pattinson, see here! Robert Pattinson has been urged to quit his womanizing ways. The ‘Twilight’ hunk’s managerial team have warned him to calm down his partying antics and focus on his career as they fear he could risk tarnishing his successful name if he doesn’t put a stop to his troublesome behavior. A source told RadarOnline: “Rob’s team felt he needed a wake up call [and] that now is the time to get extremely serious about his career, even if that means quitting the womanizing and music making that have defined his life in Los Angeles so far. The 27-year-old actor shot to fame in 2008 after landing the role of Edward Cullen in the romantic fantasy film, but his team are worried he’ll sign up to a movie at the end of this year that won’t be as successful, and could play havoc with his future career. The source explained: “Rob has to pick his next movie before the end of the year, and frankly, everyone is worried he’s going to screw this up. A Twilight baby is on the way! Actor Jackson Rathbone, who plays vampire Jasper in the hit movie series, has confirmed his girlfriend, burlesque dancer Sheila Hafsadi, is pregnant with their first child. A rep for Rathbone says the couple is “thrilled and excited” to become parents. Sources say Hafsadi, 24, is about 5 months pregnant. Rathbone, 27, met Hafsadi while touring with his band 100 Monkeys. No other details on the couple’s upcoming addition have been released. Rathbone is set to appear in The Twilight Saga: Breaking Dawn Part 2 this November. His other upcoming films include Live at The Foxes Den and Cowgirls N’ Angels. Robert Pattinson has been voted the Celebrity of the Year for a second time by fans of Eonline.com. After five weeks of voting, the Twilight star kept his crown by beating 63 other top stars, including his girlfriend Kristen Stewart. Stewart and royal newlywed Catherine, Duchess of Cambridge came close to grabbing the title but a late surge from the British actor’s fans secured the top spot for Pattinson. The Muppets’ Spoofs ‘Twilight: Breaking Dawn’ in New Posters! 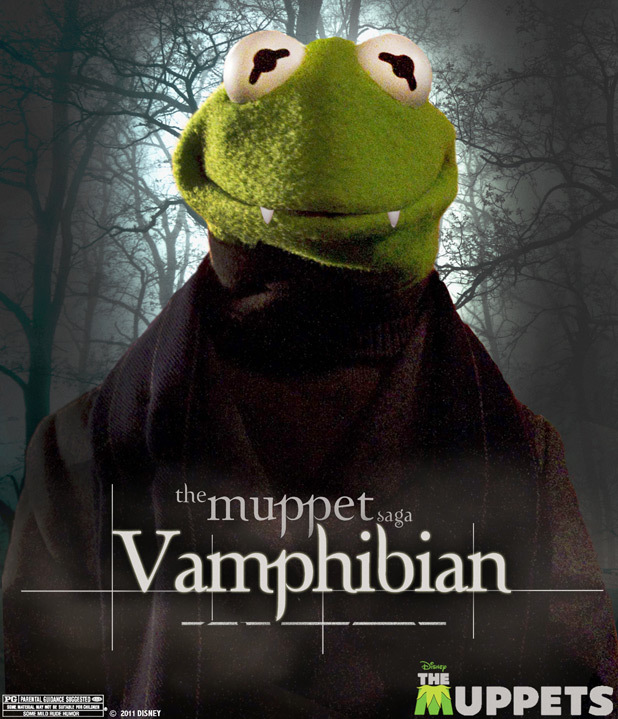 Kermit the Frog has joined the ranks of the undead. The Walt Disney Co. on Tuesday released three new posters promoting its upcoming movie The Muppets that spoof another new box office entry, The Twilight Saga: Breaking Dawn — Part 1. The one-sheets show Kermit, Miss Piggy and Rowlf parodying Robert Pattinson’s vampire Edward, Kristen Stewart’s Bella Swan and Taylor Lautner’s werewolf Jacob, respectively. It’s official Beavis and Butthead are back! They returned to MTV this week (Oct 27) after a 13 year absence. The animated series Beavis and Butthead proved to be a huge success as 3.3 million people tuned in for the revival of the animated series. According to Zaptoit, the series performed well with males, who comprised over two-thirds of the audience. The episode saw the duo tackle pop culture references such as Jersey Shore and The Bachelor. However reviews for the episode were mixed. According to The Hollywood Reporter, one critic praised, “it turns out that their brand of blunt but unexpectedly wise snark translates just as well to trashy reality shows as it did to trashy hair metal videos back in the day”, whilst another stated, “by the old measurements, the premiere episode is tepid and distant.” Many fans were more optimistic. Alan Moyer, talking on twitter said, ‘Beavis and Butthead haven’t lost a step’ whilst Stephen Hopkins declared, ‘I think Beavis and Butthead actually got funnier than it was before’. However it wasn’t enough to please everyone: ‘I hate that Beavis and Butthead is back on TV’tweeted another. The comedy, initially launched in 1993 but ended in November 1997. The teenagers still now appear as the same age, having failed to grow or mature in the past decade. Mtv President Can Toffler previously told Rolling Stone magazine, “They’re the same boneheads sitting on the same couch, commenting on things through a really simple prism”. It has been reported that Twilight star Robert Pattinson was close to throwing a punch at a camera-man yesterday when photographed coming out of a meeting at the ICM Agency in Los Angeles. The photographer, who was stood nearby taking a few shots of the star, was surprised to see the actor get aggressive on sight of his camera. “Rob already seemed to be in a bad mood as he was leaving ICM and when he saw me, he just snapped,” the photographer told X17. It would seem that Robert’s friend is the one to thank, as he sucessfully managed to calm the Twilight star. “I was just standing there, taking his picture, not saying anything, not getting too close and he just went off. He clenched his fist and got ready to hit me, but his friend told him to stop and calmed him down,” the photographer added. Pictures of the actor were taken at the scene, and needless to say he was not looking his happiest. Wearing black trousers and a black t-shirt, Rob was snapped marching energetically towards the camera with his right fist already clenched, ready to pounce on the photographer. Robert Pattinson was very moody indeed. The ‘Twilight‘ actor originally considered becoming a musician and is making the most of a break in his schedule by heading to the studio to record his first full-length record. Another friend added: “Rob has been kicking a few original songs around for a long time, but his schedule didn’t allow it. The 25-year-old actor previously recorded two tracks, ‘Never Think’ and ‘Let Me Sign’ for the original ‘Twilight’ soundtrack. Sources say the sound of the album will be “organic” and use traditional instruments. Robert’s ‘Twilight’ co-star, Jackson Rathbone, has previously praised his ability as a guitarist. Robert has also said he loves playing piano, and as a child hoped he could make a living from it. Amanda Seyfried in Red Riding Hood movie still. Twilight director Catherine Hardwicke has heaped praise on her Red Riding Hood star Amanda Seyfried, insisting the Mamma Mia! actress is the perfect addition to any movie. The moviemaker admits the young star metamorphosed before her very eyes on the set of the new thriller, inspired by the Little Red Riding Hood fable, and she never knew which Seyfried she’d be working with from one day to the next. Hardwicke coos, “She’s got one of the most incredible faces… Sometimes she’s Angelina Jolie, sometimes she’s a young Michelle Pfeiffer, sometimes she’s an alien, sometimes she’s a 15-year-old Dakota Fanning. She goes through every kind of transformation. And the director admits Seyfried was a pleasure to work with when the cameras weren’t rolling.